u ever feel teary eyed while listening to his songs? de keuze van de fan: Yes,even if he was still alive.His songs are beautiful. 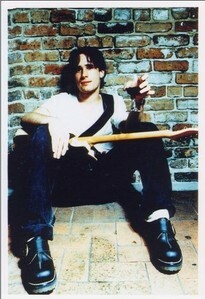 Tell me how Jeff Buckley influenced u personally? Child, u know how much I need it. Oops, maybe the titel is a lil dramatic but once I found this spot I felt the need to write my first soapbox article, because as much as I love the other things I am a fan of on Fanpop, Jeff Buckley is what I am passionate about. Soaring falsetto and dynamics reminsient of Jeff Buckley demanded the listeners attention in such a way u could hear a pin drop. a comment was made to the poll: u ever feel teary eyed while listening to his songs? What was Jeff Buckley wearing when he died? T.shirt, jeans and combat boots. He was wearing a t-shirt and his boxers.